Robert Schofield, managing director at The Langham, Chicago, brings more than 30 years of national and international experience in the hospitality arena to the luxury property. Schofield is a graduate of Foulkes Lynch College with a degree in finance and accounting, and a Fellow of the Association of Chartered Certified Accountants, United Kingdom. His background includes work as the executive vice president of operations and chief financial officer for L’Ermitage Hotels in Los Angeles; managing director of the Fairfax Hotel at Embassy Row in Washington, D.C., and for The Umstad Hotel in Raleigh, NC; as vice president of finance roles with The Sheraton Corporation and InterContintental Hotel Corporation; and as managing director of several acclaimed five-star independent Starwood Hotels and Resorts. 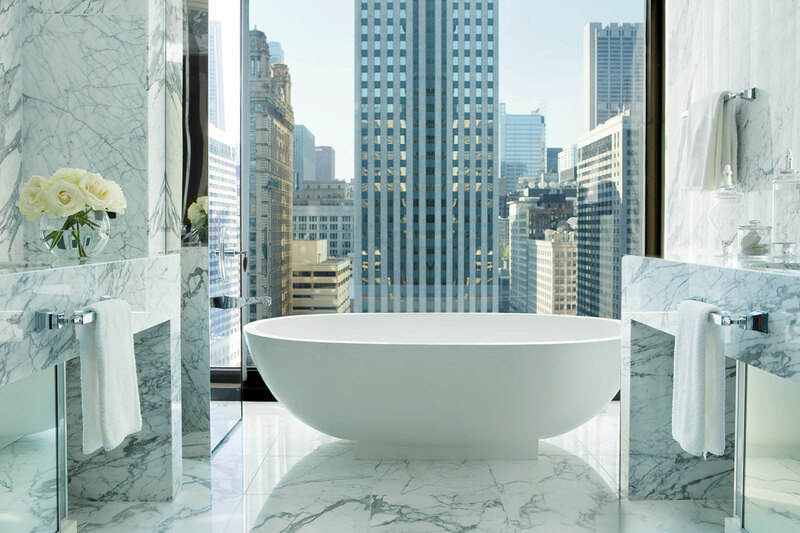 The Langham, Chicago resides within the landmark, 52-story riverfront AMA Plaza that is designed by the renowned architect Ludwig Mies van der Rohe. Offering 316 guest rooms and suites, this is the company’s first purpose-built hotel in the United States and the fourth property in the U.S. 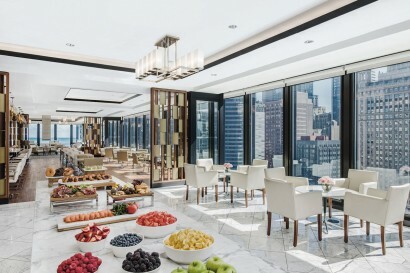 The Langham, Chicago features a 22,000 square feet Health Club housing Langham’s signature Chuan Spa; two restaurants, Travelle Kitchen + Bar, the Pavilion Lounge for afternoon tea; Langham Club with butler service and business facilities and 15,000 square feet of meeting space. The Langham, Chicago features a 22,000 square feet Health Club housing Langham’s signature Chuan Spa; two restaurants, Travelle Kitchen + Bar, the Pavilion Lounge for afternoon tea; Langham Club with butler service, light meals and business facilities and 15,000 square feet of meeting space including the elegant Devonshire Ballroom. Down Town at the Chicago River. The Langham, Chicago is conveniently located within walking distance of the city’s business district, major attractions and Chicago’s retail hub, Magnificent Mile, making the hotel an ideal base from which to explore the city or conduct business. Chicago’s retail hub, Magnificent Mile, Chicago Riverwalk, Chicago Theater District, The Loop, Navy Pier, Grand Park, Millennium Park. The hotel features a fine art collection with more than 150 pieces of distinctive artworks. The Langham, Chicago features a dedicated Kid’s Suite, a generously sized play space, where families can stop by and enjoy a variety of toys and games. The Cinema Suite is a high-definition theater featuring, a 111 inch screen and comfortable seating for up to twelve people theater style — perfect for sophisticated presentations, product launches or social gatherings. The Langham, Chicago features a dedicated Kid’s Suite, a generously sized play space, where families can stop by and enjoy a variety of toys and games. Activities include video games and board games – like Trouble and Monopoly – while the little ones will have Candyland, Lincoln Logs, a mini electric guitar, rocking horses plus a gigantic white board for coloring and many more games and toys at their disposal. In addition a 12-seat Cinema Suite features kid friendly movies. Other amenities include an indoor swimming pool with family changing rooms and showers. Kid friendly menus and child, tween and teen welcome amenities. The Infinity Suite is an opulent retreat in the heart of the city. Two elegantly appointed bedrooms with ensuite bathrooms. Formal dining facilities for up to ten guests and a private butler pantry. An oversized living room complete with a fireplace and a custom-painted grand piano. All accented by expansive views of the Chicago River and cityscape framed by floor-to-ceiling windows. 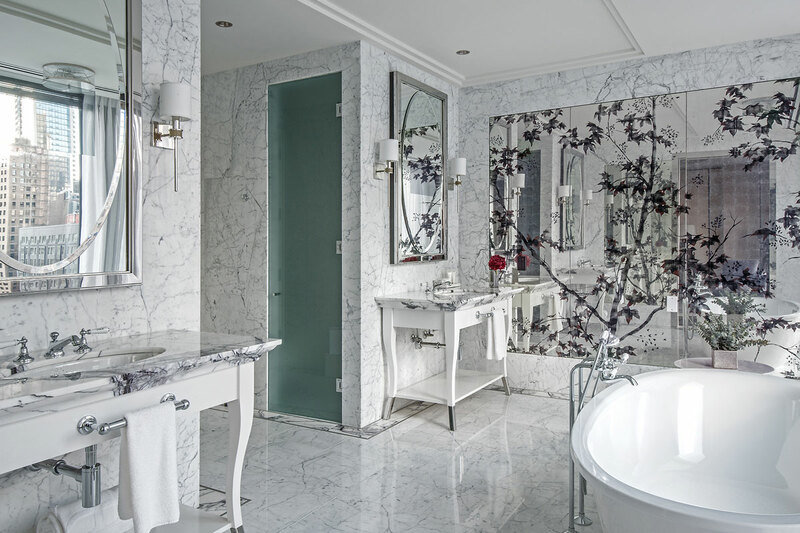 The Langham legacy is embodied in The Langham, Chicago’s Regent Suite. With all-encompassing views of the city and Chicago River, the Regent Suite features 2 separate bedrooms, fireplace, and a formal dining facilities for up to ten guests and a private butler pantry, an oversized living room complete with a fireplace. Discover a luxurious haven located on the upper floors of the hotel. A mix of classic style and contemporary furnishings, this one-bedroom suite boasts floor-to-ceiling views of the Chicago River. The living parlor features a pullout sofa bed, a small dining table for two guests, and a separate powder room. 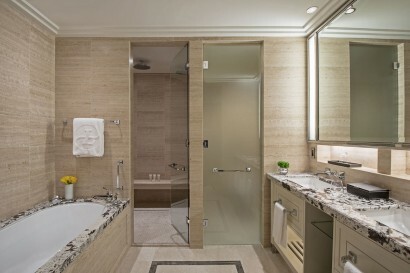 The suite offers essentials such as two 55″ LCD HD-Televisions, extra-large all marble bathroom with dual vanity, separated deep soaking tub and a walk- in rainforest shower. The One Bedroom Club River View Suite enjoys exclusive access to The Langham Club. Richly textured furnishings, wood floors, plush carpeting, and a neutral colour scheme. Floor-to-ceiling views of the Chicago cityscape. This one-bedroom suite is an inviting space that will delight every traveler. The Langham Club Suite features a separate master bedroom and separate living room parlor. The living parlor features a pullout sofa bed, a small dining table for two guests, and a separate powder room. The suite offers essentials such as two 55″ LCD HD-Televisions, extra-large all marble bathroom with dual vanity, separated deep soaking tub and a walk- in rainforest shower. The One Bedroom Club Suite enjoys exclusive access to The Langham Club. A stylish retreat high above the metropolitan streets; with hardwood floors, bespoke furnishings, this one-bedroom suite will captivate and relax. 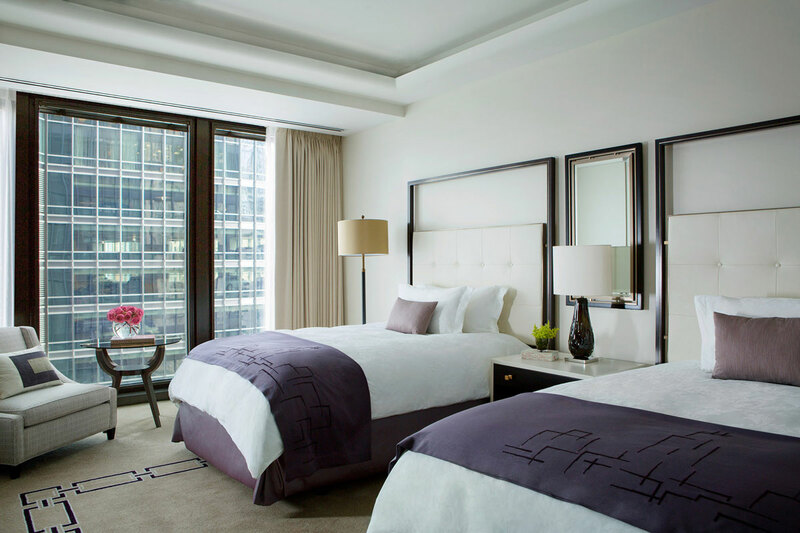 Through floor-to-ceiling windows, picturesque views of the Chicago River and the city’s iconic architecture beckon. The suite offers essentials such a separate master bedroom and separate living room parlor, two 55″ LCD HD-Televisions, extra-large all marble bathroom with dual vanity, separated deep soaking tub, walk- in rainforest shower, towel warmer and a 19” LCD television in bathroom mirror. One Bedroom Suites consist of a separate master bedroom and separate living room parlor. The living parlor features a pullout sofa bed, a small dining table for two guests, and a separate powder room. The suite comfortable accommodates up to four guests, and offers essentials such as two 55″ LCD HD-Televisions, extra-large all marble bathroom with dual vanity, separated deep soaking tub, walk- in rainforest shower, towel warmer and a 19” LCD television in bathroom mirror. The Junior Club Suite is a luxuriously studio style room appointed with a Blissful King Bed and large bathroom with a deep soaking tub and rainforest shower, complimentary in-room coffee and tea, complimentary wireless Internet, and a Cellarette with fully-stocked private bar. 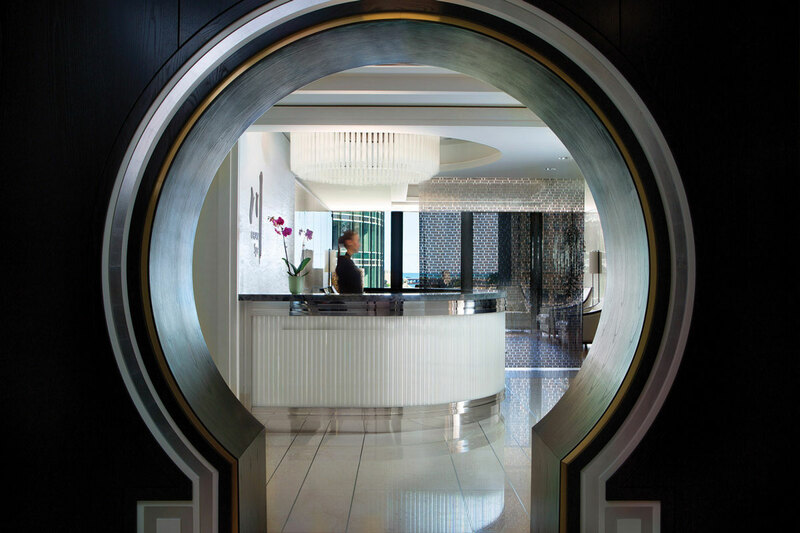 The Junior Club Suite enjoys exclusive access to The Langham Club. The Junior Suite is a studio style room measuring 720 ft². The room consists of a sitting area with sofa sleeper, signature Blissful Bed, luxurious all marble five-piece bathroom with dual vanity, separated soaking tub and rainforest shower, complimentary in-room coffee and tea, complimentary wireless Internet, and a Cellarette with fully-stocked private bar. Executive Club Rooms feature the latest technological conveniences and thoughtful essentials such as 55″ LCD HD-Television, a dressing and vanity parlor, signature Blissful Bed available as a King or Double-Beds, luxurious all marble five-piece bathroom with dual vanity, separated soaking tub and rainforest shower, complimentary in-room coffee and tea, complimentary wireless Internet, and a Cellarette with fully-stocked private bar. 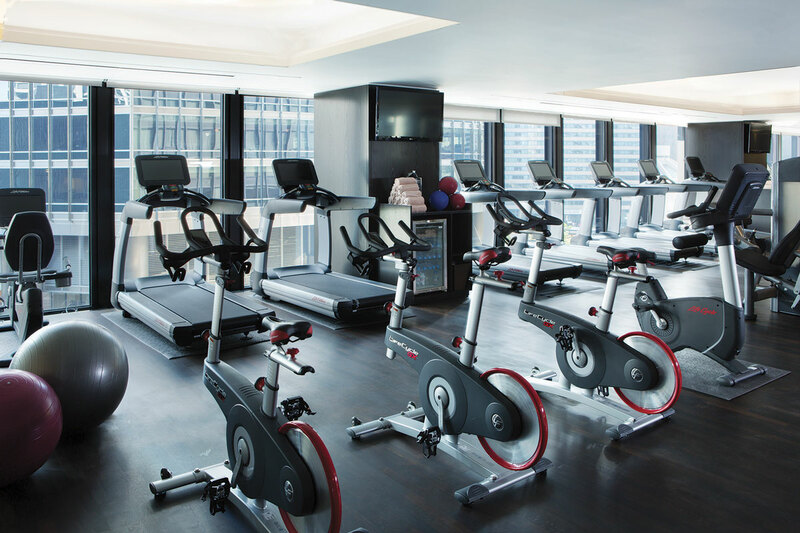 The Executive Club Room enjoys exclusive access to The Langham Club. 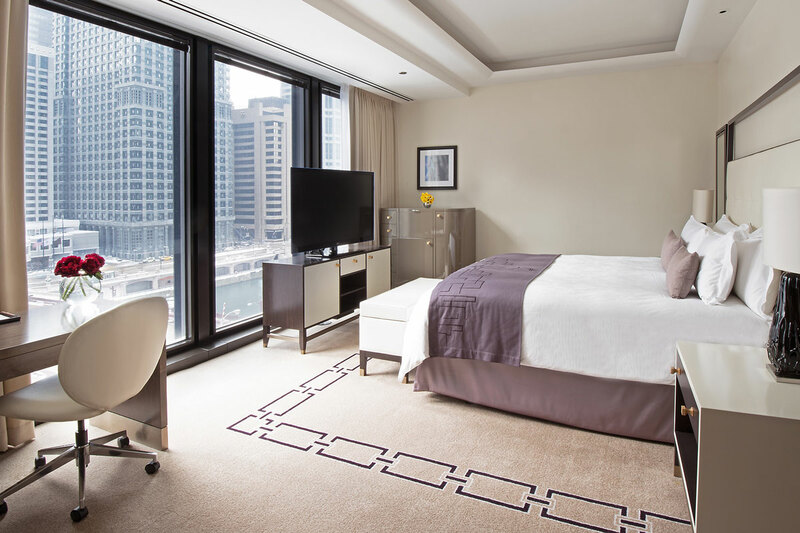 Deluxe Premier River View Rooms feature floor to ceiling windows with stunning view over the Chicago River. The room offers thoughtful essentials such as 55″ LCD HD-Television, a dressing and vanity parlor, signature Blissful Bed, luxurious all marble five-piece bathroom with dual vanity, separated soaking tub and rainforest shower, complimentary in-room coffee and tea, complimentary wireless Internet, and a Cellarette with fully-stocked private bar. Deluxe Premier Room feature floor-to-ceiling windows with picturesque views of the Chicago city’s iconic architecture beckon, a 55″ LCD HD-Television, a dressing and vanity parlor, signature Blissful Bed available as a King or Double-Beds, luxurious all marble five-piece bathroom with dual vanity, separated soaking tub and rainforest shower, complimentary in-room coffee and tea, complimentary wireless Internet, and a Cellarette with fully-stocked private bar. Our mid-century styled Classic Rooms feature floor to ceiling windows, handcrafted wood furnishings, 55″ LCD HD-Television, a dressing and vanity parlor, signature Blissful Bed available as a King or Double-Beds, luxurious all marble five-piece bathroom with dual vanity, separated soaking tub and rainforest shower, complimentary in-room coffee and tea, complimentary wireless Internet, and a Cellarette with fully-stocked private bar. 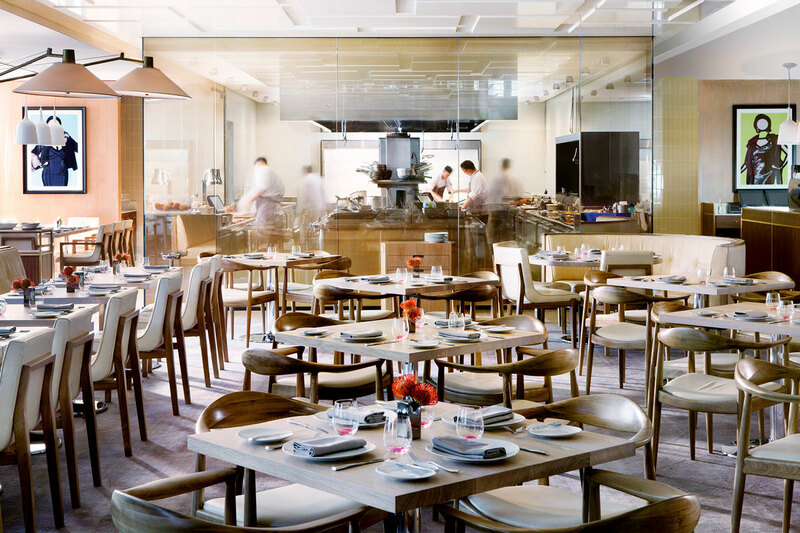 Travelle Kitchen + Bar is led by chef Ricardo Jarquin, Travelle Kitchen + Bar serves seasonal American cuisine featuring ingredients sourced from around the country. Chef Jarquin offers a culinary experience for breakfast, lunch and dinner, accented with unique and intriguing flavor combinations. Pavilion is home to the Langham Afternoon Tea with Wedgwood, the traditional afternoon tea that first debuted at The Langham, London in 1865. Afternoon Tea with Wedgwod inludes proprietary Langham teas, and an array of sweet and savory bites. Afternoon Tea is served daily 3 :00 pm to 6 :00 pm. Health Club at the Langham offers 14 cardio-vascular machines with integrated entertainment system, medicine and stability balls, functional training area and stretch mats as well as a group class studio. Hours of operations are daily 5 :30 am to 10 :00 pm. With an exclusive downtown Chicago location, choose from several elegant spaces adaptable for a variety of occasions. The Langham, Chicago delivers contemporary design, refined service and 15,000 ft² of event space, complemented with state-of-the-art technology to ensure the success of any conference or function. Located on the third floor is the Devonshire Ball Room. With a 22 ft. high ceiling and floor-to-ceiling windows on two sides, the 4,725 sq ft room can be reconfigured to accommodate two to four separate event spaces. When used as a single ballroom, the room can hold 260 for sit down dining and dancing. Cambridge Room is a Junior Ballroom at 2500 sq ft. This large space can be divided into two or three separate spaces. Albany is available for a 20 person conference. Chelsea is of 756 sq. ft. which can accommodate 47 for a sit down meal function or a reception. Berkeley is a 832 sq. ft. meeting room which can accommodate 50 for a reception. The Melbourne Room (992 sq. ft.) can accommodate 50 for sit down dining or reception. Piccadilly Room is available for a 20 person conference. Dover Suite accommodates 12 for a conference. Stratton Suite accommodates 12 for a conference. Coventry Suite accommodates 12 for a conference. Langham Club Lounge : The Langham Club is a private luxurious haven for guests who prefer a discerning level of comfort. Located on the uppermost floor of the hotel, this 3,000 square foot lounge features panoramic views of Chicago. A breakfast buffet, all-day refreshments, afternoon tea, premium bar service and hors d’oeuvres are served daily. Private arrival and departure services are provided by dedicated butlers. In addition, our Writer’s Corner – with reading library and two-computer workstations – looks out over the city. • No. 1 Hotel in the United States U.S.